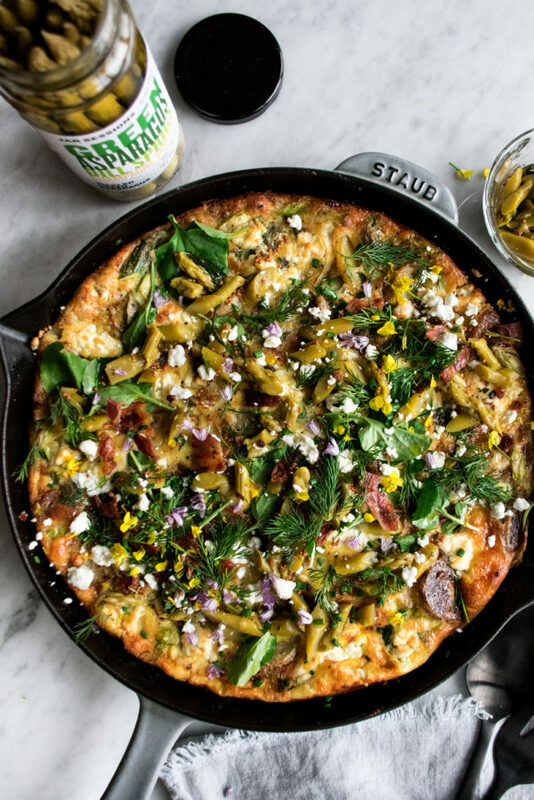 If you want a recipe that screams spring, this is it: potato bacon frittata with fresh asparagus and leeks, creamy goat cheese, a mustardy pickled asparagus topping, and lots of fresh herbs. It’s going to be oh so perfect for brunch entertaining this season! 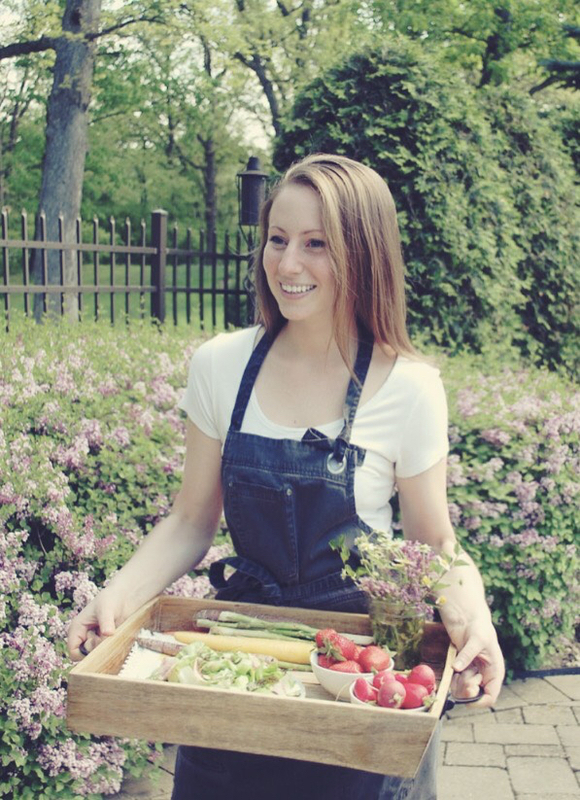 I’m very excited to continue the Jar Sessions series with today’s recipe! If you’ve been reading since last year, you’ll remember I shared a few different recipes using chef Paul Virant’s line of pickles and preserves – these short rib tacos with sweet chow chow & seared scallops with blueberry aigre-doux being my favorites. All of the pickles and preserves are what make Paul’s restaurants so intriguing and unique. And with Jar Sessions, you’re able to use some of them in your own cooking. Each jar is like a little taste of the season’s best. 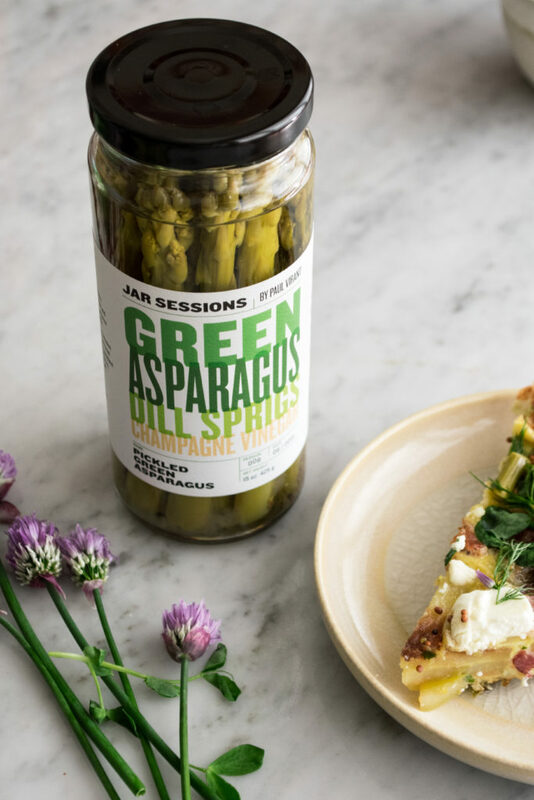 The newest Session is Pickled Green Asparagus (think bright and tangy, with a deep herbaceous flavor). And with spring entertaining right around the corner, I figured creating a frittata would be perfect. It’s a great vehicle to pack in lots of fun seasonal elements. Plus, it effortlessly feeds a crowd. Here I’ve got crispy bacon and potatoes creating the base, with caramelized leeks, asparagus, and goat cheese running throughout. 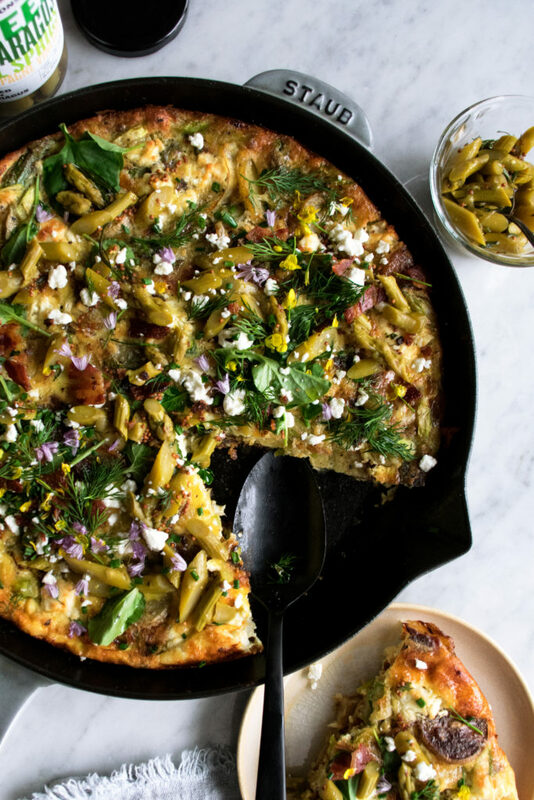 It all comes together in one skillet, and while it bakes, you’ll make the pickled asparagus topping. 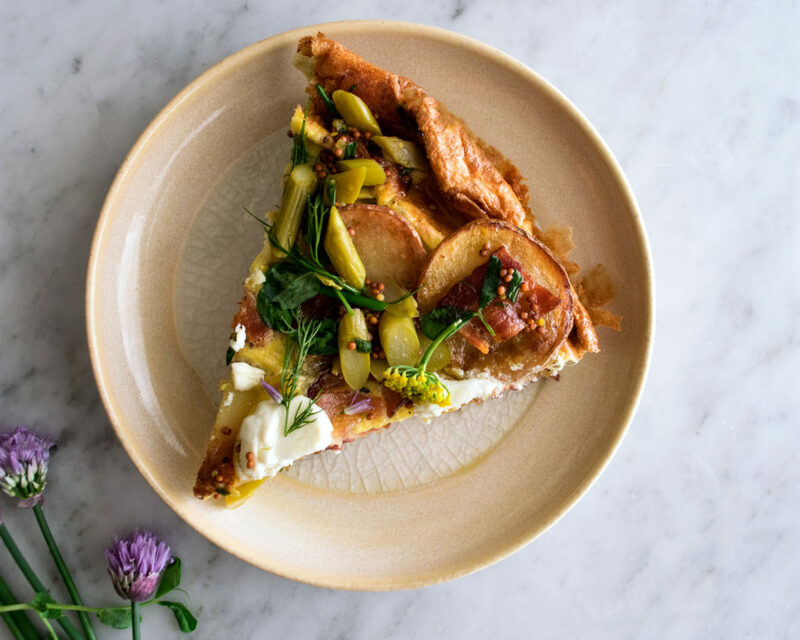 The brightness of the topping is PERFECT with the rich eggs, potatoes, and bacon. The whole thing is quite simple, yet is absolutely stunning for a festive brunch table. Preheat the oven to 375°F. 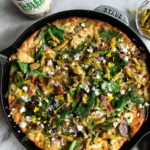 Lay the bacon in an even layer in a 12” cast-iron skillet. Heat over medium heat. Allow the bacon to render and crisp on both sides, lowering the heat as needed. Remove the bacon from the skillet and set aside. Add a splash of olive oil to the bacon drippings over medium heat. Working in two batches, fry the potatoes in the skillet until golden and crisp on both sides. Transfer them to a plate lined with paper towels and immediately season with a pinch of salt. Set aside. Add the butter to the pan. Once melted, add the leeks and a good pinch of salt. Sauté the leeks until tender. Add the sliced asparagus. Continue to cook until slightly caramelized. Season with freshly cracked black pepper. Meanwhile, beat the eggs in a mixing bowl just until homogenous. Whisk in the milk and two teaspoons of salt. Add the bacon and potatoes back to the skillet. Arrange all the ingredients in an even later. Pour in the egg mixture. Allow the eggs to cook just for a few minutes until set on the bottom (pull the eggs away from the sides as needed). Sprinkle the goat cheese over top. Transfer the skillet to the oven and bake for 16-18 minutes, or until the eggs are cooked through and fully set. While the frittata bakes, thinly slice the pickled asparagus. Strain the pickling liquid from the jar into a small saucepan over medium heat. Reduce the liquid to about ¼ cup. 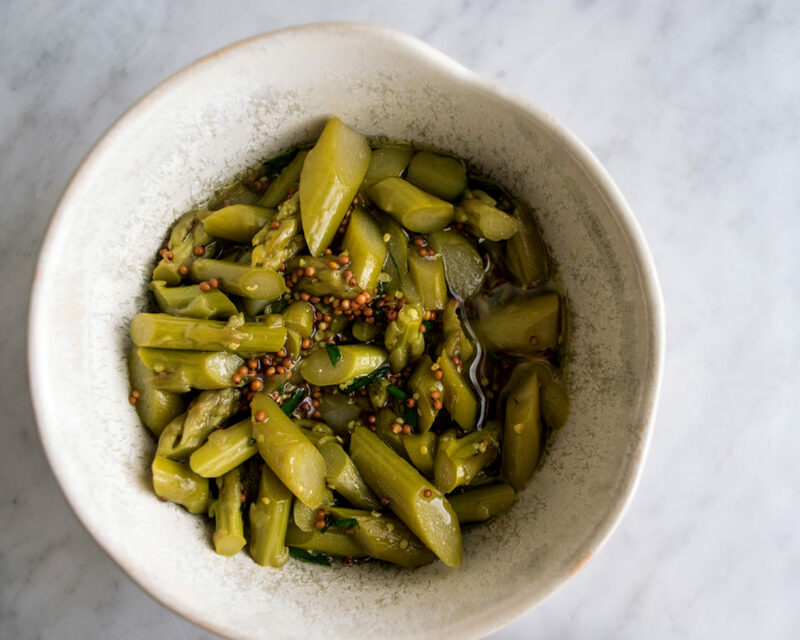 In a mixing bowl, combine the asparagus, reduced liquid, grainy mustard, honey, two tablespoons of olive oil, chives, and dill. Mix well. Serve the frittata with a sprinkling of watercress (optional) and the pickled asparagus mixture spooned over top or on the side. Garnish with fresh dill and chives.